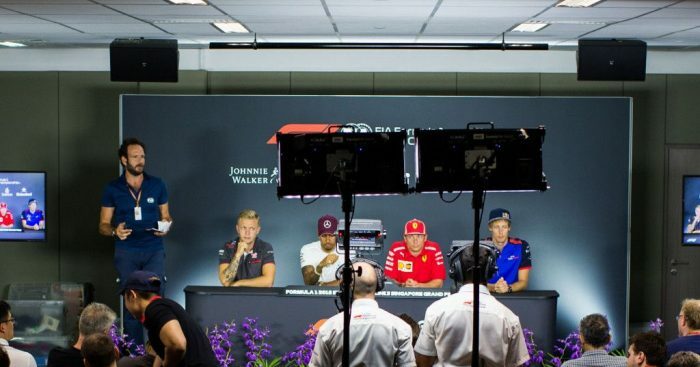 Kimi Raikkonen headlined Thursday’s opening press conference in Singapore, joined by Lewis Hamilton, Kevin Magnussen and Brendon Hartley. Q: You say it wasn’t your decision to leave Ferrari, but it was your decision to go back to Sauber, so just talk us through why you’re doing that? Q: Let’s move on. Kevin coming to you now: this weekend is your 75th grand prix, a bit of a milestone for you. Do you feel you’re part of the F1 establishment now? Kevin MAGNUSSEN: I don’t know really. I haven’t thought of it like that. I didn’t even know it was my 75th race, so I’m just enjoying… it’s the best time I’ve had in Formula 1, at the moment. It’s great fun and I’ll see how it goes this weekend and will hopefully have a good race. Brendon HARTLEY: Yeah, so everyone has told me that it’s the most physical race of the year, not only because of the heat but also the focus and stamina it requires being a long race and not many breaks on the tracks. In terms of training, not much changes. I think all of us drivers are very race fit. We’ve had a long season already and many races to warm up to a tough one like this. I’d say most of us drivers did a bit of heat training over the last week or so and for me it was just adding a couple of extra layers on when I was training on my bike. I came out a couple of days early as well, just to get used to being here. Actually, it doesn’t feel as hot as I expected. I think in previous years it’s been hotter, but nevertheless it’s going to be a tough old race. On top of that I spent some time in the simulator, learning the track as best I can before hitting FP1 tomorrow. Q: (Abishek Takle – Mid-day) A question for Kimi. At what point did you know that you wouldn’t be driving for Ferrari next season and when did the Sauber talks actually start? BH: Actually I’ve been improving all year and I haven’t really had a direct discussion about an exact result but it’s clear I haven’t finished in the points enough times, when you compare with my teammate. Some of that was out of my control, some of it part in my control but honestly, like I said before, I’m just focused – one race at a time – on doing my job and I’m very confident of the job I do behind the scenes and also I know that I’ve been improving the whole season. Yeah, just focused on Singapore this weekend. It’s a big opportunity actually for us at Toro Rosso. Historically the team’s done very well here. Last year they took fourth place with Carlos in some tricky conditions but if we take the last two races, we think this would be a strong opportunity for us. Everyone can see that I’ve been strong in certain scenarios but haven’t been able to capitalise so I think if what you’re referring to what he’s saying – I haven’t been following the press – but probably I need some more results in the points.